Proper water chorlination is essential to healthy use of a swimming pool. Chlorine tablets come in 1-inch and 3-inch sizes, sold in plastic drums. Chlorinator tablets come in 1-inch and 3-inch disks. The 1-inch tablets are typically used in smaller pools and spas, as well as in above-ground pools, because they are intended to chlorinate a smaller amount of water and will dissolve quicker. The chlorine found in tablets is known as trichlor (or Trichloro-S-Triazinetrione). This is slightly different than the chlorine used in granular forms of chlorine, which is known as dichlor (or Sodium Dichloro-S-Triazinetrione). Beyond this, the only difference is in the concentration of the chlorine within the tablet, and in the use of binders and fillers in the tablets. Cheap tablets of the type sold in large big-box retailers typically have a lot of binder and filler material in them, and they tend to fall apart quickly. Avoid this type of product if you can, instead choosing tablets sold at swimming pool supply retailers. Tablets with lesser ratios of fillers and binders will dissolve uniformly and tend to last longer than cheap tablets. The best tablets will have a concentration of 90% Trichloro-S-Triazinetrione. Be aware that while most tablets are designed to be placed in a "floater" or automatic chlorinator device, some are formulated only to dissolve when running water flows over them. Make sure you are buying the correct form of tablet—the best method is to use a floater or chlorinator device. Typically, a 3-inch pool chlorine tablet is designed to chlorinate from 7,500 to 10,000 gallons of water per week, meaning it'll take seven days to dissolve. 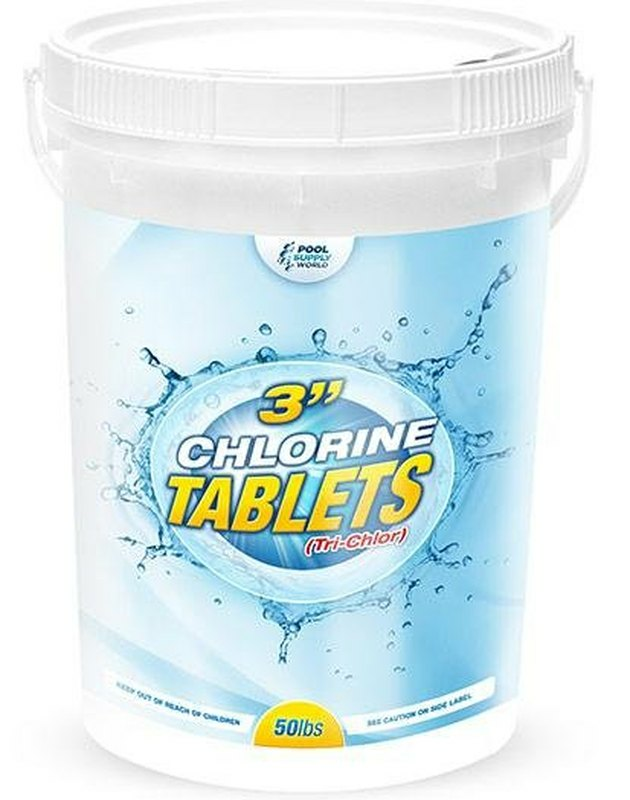 If you have a 30,000-gallon pool, you'll need to place three 3-inch pool chlorine tablets in a chlorinator or floater. Water moving over chlorine tablets, as happens in a chlorinator or with tablets designed to be placed in the skimmer, causes them to dissolve more quickly. A floating chlorine dispenser (floater) is the most inexpensive way to chorinate your pool with tablets. A floater is the simplest type of application device. 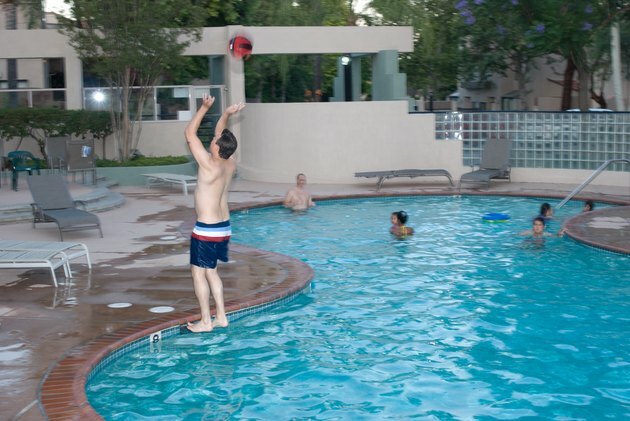 It involves simply dropping the chlorine tablets into a floating basket and then setting the basket into motion floating randomly around the pool. As it floats and moves around the pool, it slowly and gradually releases its chlorine into the water. The floater is typically allowed to float in the pool when it's not being used; remove it prior to swimming, as chlorine levels near the floater can be quite high, leading to skin and eye irritation. An in-line chlorine dispenser fits into the pool's water filtering system pipes. An automatic chlorine feeder is a small device that resembled a household water-line filter. It is meant to be installed permanently in the water pump circulation lines in your pool. 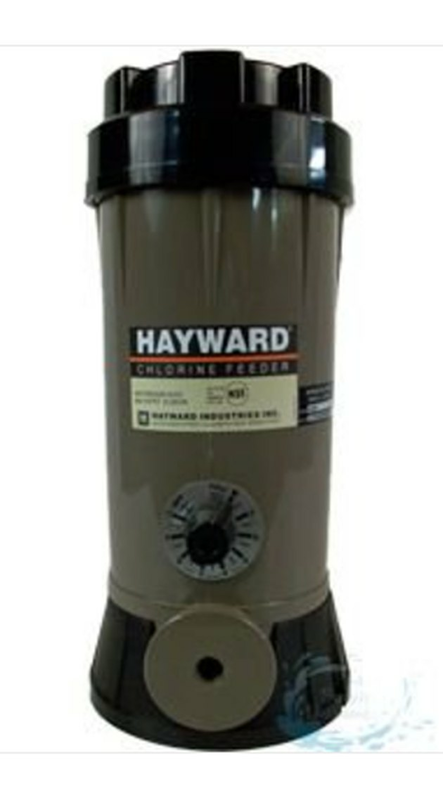 The chlorine tablets are dropped into the feeder's canister through an access cap, and the water flowing through the feeder supplies the chlorine to the pool water. An automatic feeder has the advantage of not being a visible feature to swimmers inside the pool, but they can be more expensive than floaters, and they eventually wear out and need to be replaced. 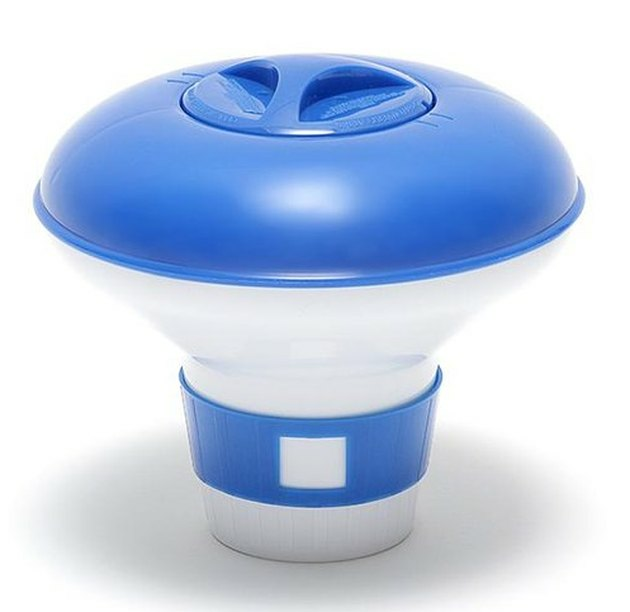 Finally, although widely discouraged, some owners place the chlorine tablets directly in the pool's filter skimmer basket. This should generally be avoided, as it will cause the water flowing through the filter system's pipes to be very high in chlorine content, which can corrode the pipes. Unless your swimming pool specifically recommends this (which is rare), avoid this method in favor of a floater or an in-line automatic chlorinator. The chlorine used in pool chlorine tablets (Trichloro-S-Triazinetrione, or trichlor) has a very low alkalinity (high acidity). By contrast, granular calcium hypochlorite pool chlorine is highly alkaline. The reason trichlor tablets are acidic is because they're stabilized and formulated from a salt of cyanuric acid (CA). CA is a very effective chlorine stabilizer that prevents sunlight from dissipating pool chlorine too quickly. However, trichlor tablets have the effect of lowering a pool's pH, so the pH level needs to be monitored and raised on a periodic basis. If you find that your pool chlorine tablets have lowered your swimming pool's pH below 7.2, you can raise it (increase its alkalinity) by adding sodium carbonate (soda ash). It takes from 2 to 4.5 lbs. of soda ash in 30,000 gallons to raise pool pH back up to 7.2, depending on how low the pH level was to begin with. When swimming pool pH is below 7, available chlorine disappears, leaving pools vulnerable to contamination. Tablets are generally safer to handle than liquid or granular chlorine. Still, handle pool chlorine tablets with care and avoid placing them in a pool's skimmer. Lastly, keep pool chlorine levels between 1 and 2 parts per million (ppm), which chlorine tablets are designed to deliver when used correctly. Used properly, chlorine tablets should last about one week before they dissolve and new tablets are needed, but pool chemistry will ultimately tell you if you if the application rate is correct.